Fear of the number 13. Friday the 13th. In the spirit of fun, then, I offer up my 13 ways to avoid VO Bad Luck today, Friday, April the 13th, 2012. 1) Get over it! Read the Skeptic’s Dictionary and see who revered the #13 in history. 2) Jump up and down in place 3 times after your second sip of coffee, and throw 3 black olives over your left shoulder before taking 5 steps backwards. That’s 13…boy that’ll show ’em! 3) OK, seriously, send out 13 emails, or postcards, or hand-written notes to 13 past clients to show ’em some love. I’ll bet one of ’em has a job for ya. 4) Never get out of bed today, which totally minimizes your risk, and avoids bad luck. (ah, but that means you miss NAILING that big audition worth a $5,000 buyout plus residuals). 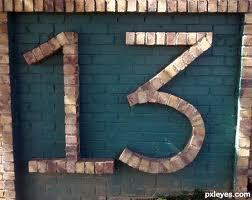 5) Write down 13 VO marketing tasks you’ve been avoiding since God was a boy, and do at least two of them TODAY! 6) Back up your hard-drive before it’s too late. Carbonite is the bomb. Brainless, and fairly inexpensive. 7) While you’re at it, vacuum out all the dust that’s choking your computer to a slow, agonizing death. You won’t believe what you’ll find inside your computer box. 8) Clear the decks, and call in sick. Tell your wife/husband to watch the kids, and finish your taxes. NOW. 9) Are you using a freelance vendor to build your website, edit a soundtrack for you, design a graphic, or take some photos? Pay ’em. You want to get paid for your freelance work, doncha? That’s just VO Karma. 10) Grit your teeth really hard, and figure out where to get the money to go to one really good coaching weekend somewhere yet this year, so you can improve your craft. 11) Send Paul Strikwerda some tulips. I’m sure he misses them this time of year. He’ll love you for it, and then he’ll write a blog about you that gets you noticed at a big talent agency, and the next thing you know you’ll be cutting network promos for ABC. 12) Take a good hard look at where you waste time every week…eliminate that…and put in its place any one of Bill DeWees‘ 100 YouTube videos telling you how to run your VO business better. I’m serious. 13) Give yourself the day off from doing anything voice-over. You deserve it.